Two virtually unknown tick born rickettsial diseases have become a serious threat to human health in China, health authorities have warned. 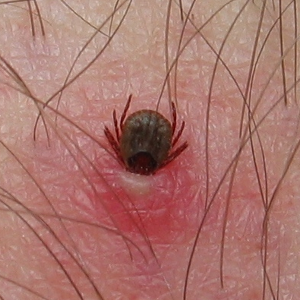 In just a few years the diseases caused by tick-borne A. phagocytophilum and E. chaffeensis have become common in rural areas and cause disease including multiple organ failure and death, according to Dr Zhang Lijun and colleagues at the Department of Rickettsiology, National Institute for Communicable Disease Control and Prevention, Beijing. In a new paper they report that the first cases of human granulocytic anaplasmosis (HGA) occurred in Anhui Province in 2006 and then in Shandong. They said human granulocytic anaplasmosis is a serious disease in which about half of patients are hospitalised, 40% of patients have multiple organ dysfunction syndrome, and the fatality rate can be as high as 8%. However, they suspected that in China infections with the two rickettsial diseases were often not recognised, and were misdiagnosed as hemorrhagic fever with renal syndrome (HFRS). In their own study they analysed 7,322 serum samples from farmers and found that 10-15% farmers had been exposed and were at substantially increased risk of the diseases. A second analysis of 819 blood samples from urban residents from showed that 4-12% of urban residents had been exposed and were also at high risk of the tick-borne diseases. Worryingly, the infections were carried by a wide range of ticks, not just one species, and the ticks were found on many domestic animals and livestock including dogs, goats, sheep, cattle, horses, rabbits and rodents. The researchers concluded that the wide distribution of the tick-borne infections and their serious nature meant that their transmission and risk factors "urgently needed to be further investigated."